2Midwifery and Reproductive Health Research Center, Department of Midwifery and Reproductive Health, School of Nursing and Midwifery, Shahid Beheshti University of Medical Sciences, Tehran, Iran. 3Department of Psychology, Islamic Azad University, Roodehen Branch, Tehran, Iran. 4School of Nursing and Midwifery, Shahid Beheshti University of Medical Sciences, Tehran, Iran. 5Mahdiyeh Hospital, Shahid Beheshti University of Medical Sciences, Tehran, Iran. Objectives: Inability to have a child is stressful and affects all aspects of couples lives. Infertility diagnosis, duration and reason of infertility, treatment failure, and frequent pregnancy tests, are among the stress-inducing factors in couples.The current study aimed to compare infertility related stress among couples and evaluate its relationships with infertility factors. 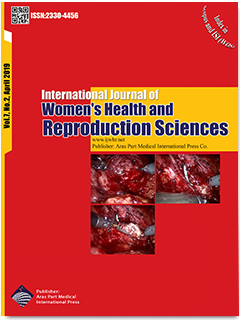 Materials & Methods: This cross-sectional study was performed on 150 infertile couples (300 individuals) visiting infertility centers of Tehran. The data were collected using the Fertility Problem Inventory (FPI)and fertility demographic characteristics. Sampling was performed through the convenience method. The data were analyzed through inferential statistics, including paired samples t-test, independent samples t-test, ANOVA, and linear regression. Results: According to the results, the mean score of women’s stress was significantly higher than that of the men (P=0.007). There was a significant difference between the males and females regarding the mean scores of social concern and need for parenthood (P=0.005). The mean score of infertility-related stress in women with treatment failure was also significantly higher than that of the men (P=0.01). Conclusions: As the findings of the present study indicated, the infertile women experienced greater stress than the males. Furthermore, infertility-related stress increased in women due to the treatment failure. Therefore, it is recommended that women who have experienced treatment failure be subjected to precise psychological evaluations before undergoing the treatment process.